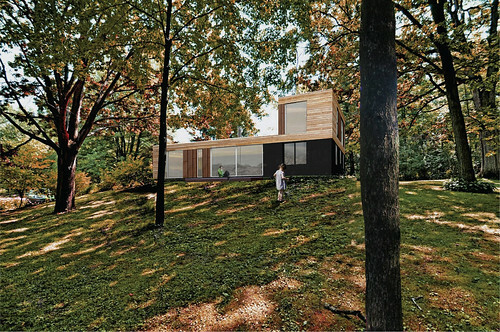 The first wave of plans and design concepts came in from our architects, Johnsen Schmaling, and this was not an easy request for them. I know one builder kept recommending we just level the whole place and start new, but that wasn’t the approach we’re looking for. Due to budget constraints, some of our “green” building dreams aren’t going to be possible but we figured a big step in the right direction is to use what we can from the house. So, we asked to keep some of the foundation and brick exterior. Most of the interior is water damaged, stained, falling apart and overwhelmingly stinky. The original house is about 1400 sq ft and a terrible flow. Our building budget is just over $300k so Johnsen Schmaling suggested we stay within the footprint of the house. Within this we need to fit: 3 bedrooms (one a master suite), an open living/kitchen/dining space, an office for Zach, some kind of studio/work space for me, a mudroom, a laundry room and a garage. They gave us several floor plan options and it didn’t take long for us to decide which would work best for us. We had minimal changes and really feel like they nailed all of the objectives. Honestly, how great is that entry way? 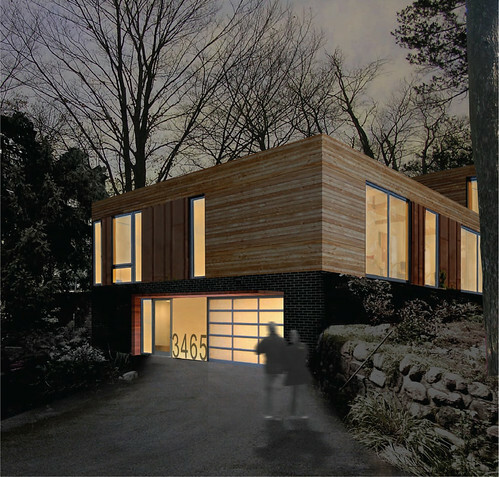 Tagged ann arbor, Architecture, bid, building, concept, construction, debord, home, house, Johnsen Schmaling, michigan, modern, process, residence. Bookmark the permalink.